Let me tell you about the way of life. The weekend after my 27-year-old son David was killed crossing a street near his home, the police came to the door with his black backpack. Inside were his laptop, his glasses, and a small, white paperback, titled, The Way of Life. I ran my fingers over the cover. 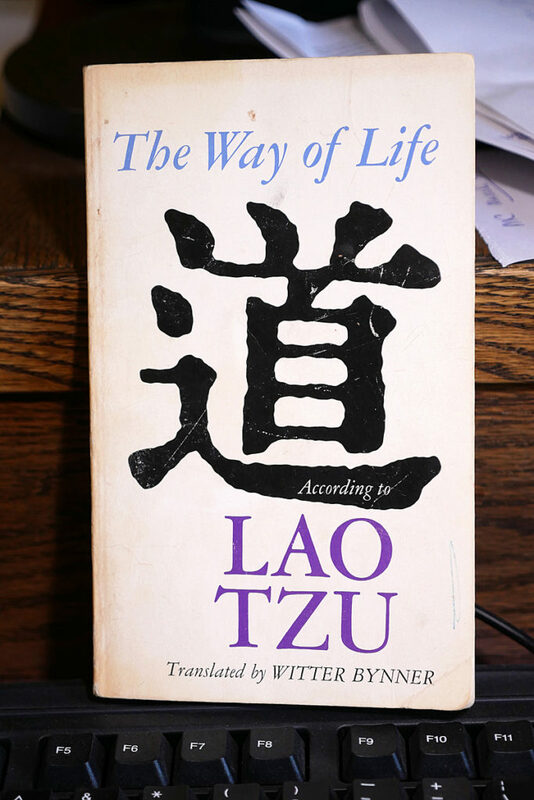 The last thing my son had been reading before he died was a book called The Way of Life. Now, his life was over and I had to find a way to live without him. David and I shared an enormous love of books. He started university late, at 25, after years of working low-paid jobs to support his real love, creating music with his band. He’d been skeptical of higher learning, believing everything he needed to know was in the books he read. And he read a lot. But, university opened new worlds, and he was delighted to fully immerse himself in what fed his soul: literature and music, and a new passion, philosophy. At Christmas, the month before he died, I slipped a first-edition copy of The Rainbow, by D.H. Lawrence, under the tree. The leather-bound book, with pages as filmy as tissue paper, had belonged to David’s grandfather and was passed down to our family. Now, I thought, it was time for our eldest child to take it home and place it in his own bookcase. I was numb. There was no order in my cosmos now, only chaos and fear. My husband and I sent the backpack and its contents home with David’s girlfriend. If it gave her any shred of comfort she was welcome to it. Still, I couldn’t stop thinking about The Way of Life. David and I often discussed our latest reads. I longed for that connection with him one last time. I wanted to hear his thoughts on LaoTzu’s philosophy. I needed him to refresh my memory on a book I had not seen or thought of in many years. I searched my bookcases, hoping my old university copy was still there. It wasn’t. So, the day after my son’s funeral I drove to the Millcreek Used Book store, located in an old brick building just around the corner from the house David had shared with his girlfriend. It wasn’t my first visit to the shop, where exotic and sometimes rare, works of literature shared the dusty stacks with self-help books and celebrity biographies. Only the month before I was able to get my hands on a book there that David wanted for Christmas, The Castle, an unfinished work by Franz Kafka. I thought back to those frantic days leading up to the holiday. I looked everywhere for that book. It was no longer in print and there wasn’t a copy to be found. But three days before Christmas, David left a phone message. Millcreek had The Castle, he said. I picked it up that afternoon. And here I was five weeks later, breathing in the musty, mysterious scent of pages yellowed with time. The knot in my stomach eased. While I was treading through a dark, new life, everything here was unchanged. And here I was five weeks later, breathing in the musty, mysterious scent of pages yellowed with time. The knot in my stomach eased. While I was treading through a dark, new life, everything here was unchanged. There was comfort in knowing that whatever happened in the world, nothing could alter the outcome of the stories that surrounded me. From the time I was a child, books were my escape from anxiety and loneliness. At night, in bed, I forgot my father’s anger and my mother’s unease as she tip-toed around his silent rage. Under the covers, the beam of my flashlight carried me to worlds of mystery and adventure. I rode on the backs of camels through baking deserts, my companions treasure-seekers looking for the hidden tombs of long-dead pharaohs. I stood on a raft, plunging my pole into muddy river waters, silently paddling through the night away from home. All my life, books had shown me the way. One more time, I thought, just one more time. Please, let Lao Tzu show me the way. The man at the front counter listened to my request. His eyes turned to a pile of books in front of him. “Well, that’s odd,” he said, rummaging through the stack. “I’m sure I saw that book this morning.” He pulled a small, white paperback from the bottom of the pile. The cover read, The Way of Life. He smiled. “It must have been waiting for you,” he said. The Way of Life sits on my desk, always within easy reach. These are the opening words: “Existence is beyond the power of words to define”.